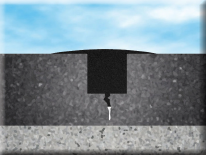 Ideally, hot rubberized crack sealants should be applied when the air temperature is between 45° and 65°F in geographic areas that are subject to cold winters. 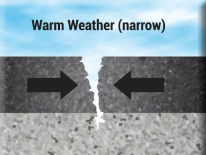 Cracks open up wider at cooler temperatures and contract or become narrower in warmer temperatures. 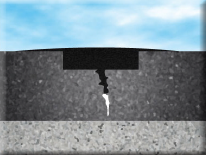 It is advantageous to apply crack sealant when cracks are opened wider. 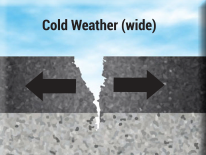 However, in warmer southern climates, this becomes less important as cracks tend to not move or open up as much. 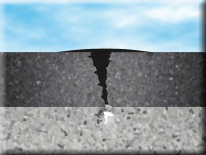 The crack sealant should be applied leaving a thin over-band of material on each side of the crack. Thick over-bands and material ridges should be avoided to avert snow plow damage in colder climates. In summary, use the best sealant, clean and dry the cracks, don’t overheat the material and don’t excessively over-fill the cracks.